I am one of those illogical people who is amazed when something of world importance happens to be on my doorstep. I mean – it has to be on someone’s doorstep, doesn’t it? Culham is home to UKAEA’s research facility into Nuclear Fusion and is the world’s most advanced magnetic confinement research programme anywhere in the world. It is home to MAST (the UK’s fusion machine) and JET (the EU’s Joint European Torus). Nuclear Fusion is probably the most difficult thing that mankind has ever attempted, so the work they are doing on my doorstep is right up there on world-scale impressive things. I visited Culham last week and was shown around their impressive facilities. It is fascinating stuff and provides more than a little food for thought. Let’s start with Nuclear Fusion. It has been described by a certain dishy physicist as mankind’s “Get Out of Gaol Free Card”. We don’t appear to have too many other answers about how we are going to supply an ever-increasingly energy hungry world with electricity that doesn’t rely on fossil fuels. Renewables such as wind, tidal, hydro and solar will play their part but there is no realistic likelihood that they will be able to replace the amounts of electricity that we are generating using coal, oil and gas – we simply couldn’t install enough of them. Nuclear Fission (traditional nuclear power stations) is a likely stop-gap but has significant problems, not least of which is managing waste which is radioactive for thousands of years. So Nuclear Fusion carries heavy expectation on its shoulders – it promises big advantages in the conundrum of how to produce electricity without frying the planet or using up resources that future generations also have a claim to. But therein lies the rub – it’s still a promise, a hope, a research facility. And will remain so for some years. The reasons are twofold – one is that it is extremely difficult to do, and the second is that it is underfunded: the second reason only being slightly more controversial than the first. Nuclear fusion produces energy by fusing atoms together at massively high temperatures. It is the same process at the heart of the sun and the stars. But on earth we have to use much higher temperatures because we cannot reproduce the mass of the sun. 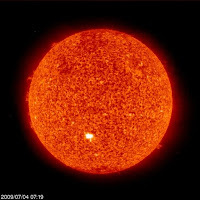 So where the sun is a mere 15 million degrees Celsius at its core, scientists have to heat plasma to 200 million degrees Celsius to get deuterium and tritium atoms to fuse together. It’s a tall order which is posing all sorts of problems and keeping some very bright brains more than occupied. As for the funding issue, we spend about £75m per year on fusion research in the UK – that’s our own UK research on the MAST programme plus our contribution to the EU JET programme. Even I don’t think that’s a lot of money when you consider the scale of the problem and the potential benefits involved. We (that’s you and me the taxpayer) spent £1.6bn on refurbishing the MOD headquarters at Whitehall in 2007. It was agreed to be extremely good value considering the quality of marble and oak that was used. I only mention it to give you some sort of benchmark and so that we can be clear on where our priorities lie. The UK’s energy spend each year is £75bn. So we are spending 0.1% of our energy expenditure on trying to find a credible replacement for our carbon-based fuels. In the meantime our government is collecting £780m in tax from the UK’s largest energy company. I hate to think what that figure might be if you added the tax from all the UK’s energy companies together. By now I hope you are beginning to think that our efforts to replace carbon-based fuels are beginning to look a little half-hearted, despite what all those fluttering windmills would have you believe. Not all problems have an easy solution, and a deeply embedded problem like our addiction to carbon-based fuels took hundreds of years to take hold. Undoing the damage we realise we are now doing is going to take at least as much effort. And for those interested in such things – the picture is of the sun taken by NASA at 7am this morning, Saturday 4th July 2009. Neat, huh? I was reading recently about how unremarkable famous people are to their next door neighbours. Great writers and artists in particular, whose faces are not known in the media. Their neighbours know them as 'Tom' or 'Angie' or 'Steve' or 'Jenny', completely oblivious to this mind of genius across the fence from their doorstep. The point, I think, is not that there is something remarkable about unknowingly living next door to a genius, but rather that all people are remarkable; there is remarkable beauty, life, and creativity all around if only we care to look. So, I am grateful that you cared enough to look and share. I'd be delighted if you visited. David - thanks for your comments about the genius next door. How right you are! Thanks also for the lovely photos - just beautiful!